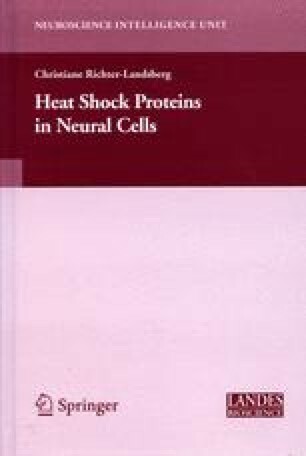 Heat shock proteins (HSPs) or so called stress proteins have multifunctional roles and are involved in many physiological processes, such as cell cycle control, cell proliferation, development, organisation of the cytoarchitecture, regulation of cell death and survival, and play regulatory roles in cellular aging and longevity. They participate in protein synthesis, protein folding, transport and translocalization processes, by acting as molecular chaperones. As a result of a variety of stress situations, HSPs accumulate and help to prevent protein misfolding and aggregation, provide tolerance against further stress situations, and cooperate with the ubiquitin proteasome system during protein quality control. HSPs are differentially expressed in nerve cells and glia, and cell type specific responses to various stressors are observed. Stress proteins may serve as biomarkers to identify stress specificity and localize pathological processes, leading to cell and organelle damage in the nervous system. They can be used as neuropathological markers and are promising targets for therapeutic intervention and drug development.